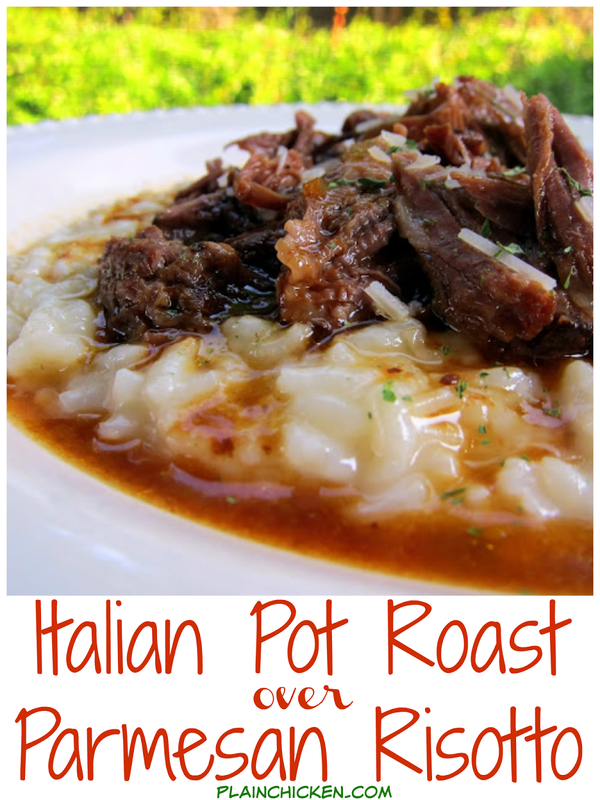 Italian Pot Roast over Parmesan Risotto - THE BEST pot roast! Pot Roast slow cooked all day in tomato juice, italian seasoning and au jus mix. Serve over a quick homemade parmesan risotto. I literally licked my plate! A few months ago we were eating at our favorite place, Gianmarco's, and I got the special of the night - braised short ribs with parmesan risotto. It was AWESOME. Chicken Legs was disappointed that I ate it all and didn't even offer him a bite (it was that good!). Ever since then I have been searching for a recipe that was similar to the special that night. I finally settled on this recipe and it was great! I was nervous about dinner tonight since this was my first attempt at pot roast and risotto. The pot roast was tender and juicy. The risotto was perfect. We loved the au jus that the roast made. It went perfectly with the risotto. I told Tadd not many wives come home at night after working all day and whip out risotto! Chicken Legs declared this meal his favorite of all the new things that I have made so far - pretty good! Place roast in slow cooker. Whisk together remaining ingredients and pour over roast. Cook on LOW for 8-12 hours or on HIGH for about 4-1/2 hours. In large skillet, evenly coat rice with olive oil. Add 1 cup of heated chicken broth, stirring continually. Maintain a slow boil and add rest of broth, 1 cup at a time, while stirring continually. When all the broth is absorbed, add cheese, onion powder and pepper. your twitter status sounded so delicious that I had to search for this! It's getting pretty chilly in GA for some reason and this would really hit the spot on these cold nights. Sounds great! Love the risotto also, bravo! I usually don't even like roast but this was yummy! I made it on Sunday and put it on around 8 that morning for Sunday lunch, next time I think I'll cook it all night so it will be more tender but it was great, have people asking for the recipe so I'm sending on the link! shelly - this is the only roast I like too! Perfect!! Thanks for linking this up to my slow cooker recipe index! what kind of roast do you recommend? Mine always comes out so tough? Maybe I'm doing something wrong. Megzay - I've had good success with a blade roast. It is pretty lean and is always fall apart tender. Blade roast. I will have to get that next time. Thank you. Can't wait to try this recipe. Do you add anymore liquid than the 12oz can of tomato juice? Kaydee and TJ - no, I only add 12oz of tomato juice. It makes a lot of sauce. I have it in my crockpot right now - it is the only pot roast I'll eat. Kaydee - You are so sweet to say that - thank you so much! Quick question - is the amount for the onion correct? Should it be 1 T of onion powder? Or one whole onion? 1 T of onion just doesn't sound right. This sounds delicious! I used a tablespoon of dried minced onion flakes - feel free to use fresh and increase to your desired level of onion flavor. I just made this last night and it was fantastic!!! I only did the pot roast part. I'll try risotto another time. This is now my "go to" recipe for pot roast. Thanks Steph!! kjwcook - I'm so glad you liked it! My bf is allergic to tomatoes. What do you think I should use instead? Sounds delicious! Caro - maybe red wine or beef or vegetable broth. I saw some Arborio rice at Kroger today and bought it to make with either this one or the 3 envelope recipe... I was so excited! I miss Publix!! You will love either one! Since I only cook for myself and hubby, and he won't eat leftovers, can I halve the risotto recipe? How many servings do you get from the original recipe? Steph - this was amazing!!!! Best pot roast ever! It smelled to die for and. Tasted better than a restaurant could do ;) love your recipes..thank you!!! Melissa - YAY! This is the first pot roast that I enjoyed. So glad you enjoyed it too! Hi what can i use instead of au jus mix & dried italian salad mix. I didn't make the risotto this time but the roast was easy and delicious! Thank you! Your recipe calls for one pound of arborio rice. What is the equivalent in cups? Can't wait to try the recipe for the roast. I've been trying some of your recipes lately and made this one last weekend. My family loved it. We used mashed potatoes instead of the risotto though. This was so very tasty! Thank you! I would use 1 cup tomato sauce and 1/2 cup water. The tomato sauce might be too thick. I think it would be fine if you mixed it with some water. Hope it works out! if I want to make this for ten people what do I do? I have Jasmine rice, would that substitute ok? Forgive me for not having an experience with Arborio, but this sounds so good, I must make it for dinner tonight! I've never made risotto with jasmine rice, but it should be ok.
Hi Stephanie- can't wait to make this for Vday! As for the Parmesan, do you use the grated kind (in the green can), freshly grated (from a block), or the pre-shredded Parmesan (in a container or bag)? I used pre-shredded Parmesan in the container/bag, but the can or fresh grated will work too. Anyone who is reading this and isn't sure: MAKE THIS NOW. I am eating leftovers and still sitting here saying, "Mmmm, oh my gosh." How often does *that* happen with leftovers? This sauce kills it - I want to bathe in it, rotfl. Making this tonight but am going beef broth for chicken broth in the risotto to add to the beefy goodness. Making this today, but forgot to buy the italian seasoning, and not feeling like running back to the store! Ideas on replacements? I have onion soup mix, garlic & herb seasoning mix, or a little seasoning salt? Making this for dinner tomorrow,,,,sounds so delicious! Everything I've tried of yours has been fantastic Thank you! OMG!!!! You have seriously outdone yourself! It is so delicious, the risotto goes perfectly! It is so worth making the risotto from scratch. Thank you again,,,going into the family favorites book! I made this tonight and it came together well but my family found it much too salty. Any suggestions on reducing the sodium in the roast? The only thing I can think of is to make sure there is no salt in the tomato juice. hi Stephanie- have you ever made this in an instant pot or pressure cooker? Was wondering what the time difference might be.. I haven't made this in the Instant Pot, so I am not sure what the exact cooking time should be. I could definitely be done though.